Tabloid-size view binder features durable construction that is ideal for frequent reference. The 11" x 17" size is perfect for engineering documents, blueprints, planograms, financial spreadsheets and more. Two clear interior pockets offer improved organization and storage. Slant ring has a higher page capacity compared to same-size round ring. Rings are back-mounted so pages lie flat. 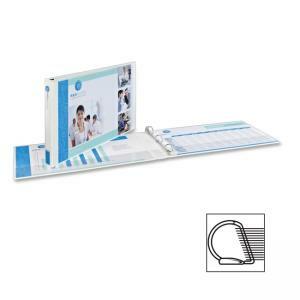 Heavy-duty view binder also features a 3" capacity and exposed rivets on back.